AirPlay 2 isn’t here yet, but with iOS 11.2.5 and iTunes 12.7.3, Apple snuck in new remote control capabilities for tvOS and, presumably, the upcoming HomePod. You may even have stumbled across these new features and wondered what they were! In the iOS Control Center, press the media platter to reveal playback controls. If you have a fourth-generation Apple TV or Apple TV 4K, you should see a new lozenge under the normal playback controls; those with more than one Apple TV will see a lozenge for each. (Sorry, this new feature doesn’t work with second- and third-generation Apple TVs). We’re guessing that the HomePod will get its own lozenge too. The lozenges appear regardless of whether you’re playing anything on the associated device; they’ll just say Not Playing if nothing is playing. Otherwise, each lozenge displays information about the media that’s playing, and tapping the lozenge reveals media controls for that device. In iTunes on the Mac, click the AirPlay button, and you’ll see a list of Apple TVs under the Switch To heading. Click one to make it so the iTunes media controls manage that Apple TV’s playback instead. On Twitter, Christian Raddatz pointed out that once you’ve switched iOS or iTunes over to controlling the Apple TV, any music you load in the iOS Music app or iTunes will start playing directly on the Apple TV. If you start a playlist on your iOS device or Mac, it too will play on the Apple TV. This trick also works with Apple’s Podcasts app on iOS, but not third-party apps like Overcast, and it works only with audio, not video. To switch back on either platform, follow these instructions again but choose the device itself instead of an Apple TV. That’s it! This new feature isn’t earth-shattering, but it is a convenience for Apple TV users. I’ll discuss these and other new features in my upcoming update to “Take Control of Apple TV,” which is now in the editing process. This breaks Air Play as far as I'm concerned. First when I click on the AppleTv in iTunes, it asks me to 'Enter the AirPlay code for device .......'. What is the AirPlay code? Secondly, I use to be able to choose the AppleTV 4k as part one device of several to send the audio stream from iTunes to. Does this mean the AppleTv or the HomePod won't participate any more? The code is displayed on the TV screen… it’s a one-of security measure to stop neighbours, etc., sending stuff to the ATV. Nothing changes in regards to playback from iTunes - you can do exactly what you did before. Just put checkmarks next to the devices where you want to send the audio. You'll also see a *new* option beneath the checkmarks - that's what is described in this article. So you can continue to playback music through iTunes to your remote devices (as always), plus you now can control those devices through iTunes even when they're playing some other audio source. It's hard to describe, but very easy and intuitive once you try it. The code thing has been there, but it was only recently enabled by default. You can disable it by going to Settings > AirPlay > AirPlay, and change Everyone to Anyone on the Same Network. While on that AirPlay screen, go to Require Code and change it to Never. As you stated this new feature isn’t earth shattering but it is a feature I have been waiting for a LONG TIME. 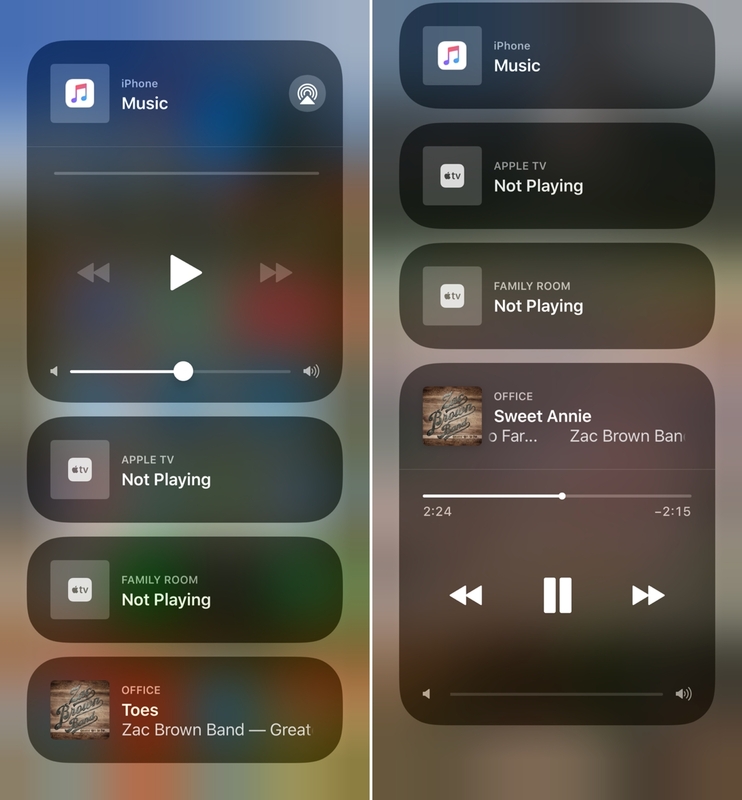 It allows to play Apple Music directly from the Apple TV without turning on the TV and controlling it from an iPhone or iPad without the need to use AirPlay. Is is a collateral benefit from the introduction of the HomePod and one step in the roadmap to the complete implementation of AirPlay 2. 1- No power consumption from you 50”, 60”, etc. LCD and you don’t need to be in front of your TV. 2- No battery drain on your controlling iPhone or iPad dedicated to AirPlay. 3- NOT MENTIONED ANYWHERE AS FAR AS I RESEARCHED: because there is no AirPlay encoding, if you use good quality headphones you can perceive a slightly (by a thin margin) better sound quality using the Apple TV directly. You must change between the two ways many times to notice the difference but for perfectionists this is important. 1- If you don’t have the Apple TV connected to a receiver the only way to be able to have sound output from the Apple TV is to route the audio from the Apple TV to an AirPort Express. Another method would be using a HDMI splitter with audio output but this is to weird. 2- It takes some time to get used to this new iOS 11.2.5 functionality because to change the source that Apple Music controls it is necessary to select it from the new Control Center music controls. I think that in a future Apple Music this will be possible from within the app. And it tends to reset to control music on the controlling device so that if one opens Apple Music later again one must check at the controls at the bottom what Apple Music source is controlled.